Regarding personal branding, many of the experts suggest heavy doses of self-promotion and cater to the elite. Much of the audience who buys and reads a personal branding book wants to hear stories of how to make it big. This might be landing an elusive job at a top company, becoming a thought leader, or making tons of connections in social media. How do you reach these accomplishments? A common suggestion is self-promotion. A difficulty for many of us is what to ‘self-promote’ (especially early career professionals). Size, scope. There are an astounding 5,000 colleges and universities in the US; total undergraduate enrollment was 17.7 million in 2012. [i] Getting in one of the top 100 of the colleges and universities is ridiculously challenging. It largely depends on a near perfect high school GPA, which barring geniuses, requires a lot of maturity. Tangible talent. Regardless of the college, it is statistically hard graduating with top honors; there is a bell curve and lots of smart people. Many talented individuals do not perform well in college. Lacking leads. Most of us are not ‘connected’, so have to build our reputations on our own. Costly credentials. Acquiring credentials is expensive and time-consuming. Not everyone can afford the expense. 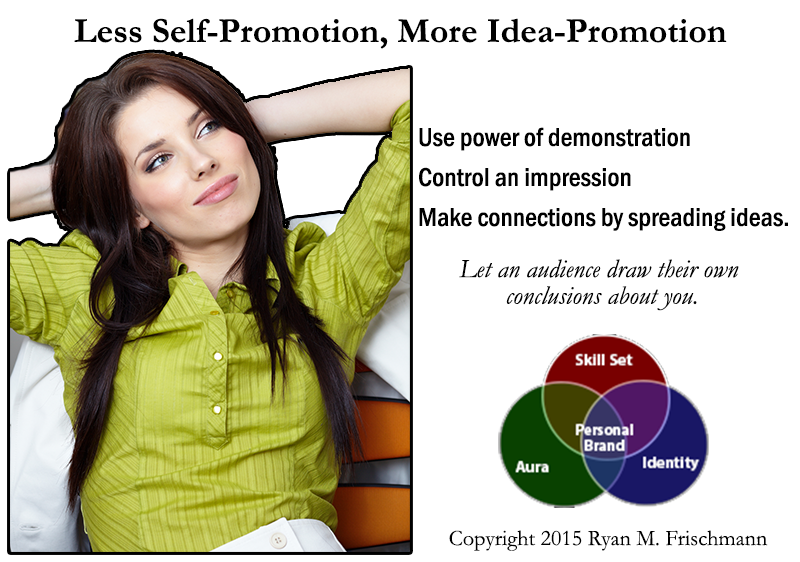 ‘Idea promotion’ over ‘self-promotion’. Use the power of demonstration. Allow others to assess your skills by seeing what you can do. Build your own identity and network. Make connections and establish an online identity from scratch. Spread your ideas to make connections. Control the impression. The idea of an aura (an element in my personal brand model) is to have someone come up with their own impression of you, without you telling it to them. How do you use ‘idea promotion’? You publish past work projects from a college course or an employment experience on a personal website (or LinkedIn profile). You write and maintain a blog where you share interesting insights. You choreograph a video that exemplifies you. In all of these cases, you let your audience draw their own conclusion about your ideas – what you have to say! How do you make connections from scratch? You participate in some combination of the major social media platforms. This is where you share insights, link to published works, and comment on the posts of experts in your discipline. It is not about talking about you and your accomplishments, but rather spreading your ideas and showing interest in other peoples’ ideas. Hard to deny self-promotion has its place in being successful, albeit depending on how you define successful. We face acute competition to establish a career and build a reputation, so self-promotion is a way to get ahead, gain an edge. If you have the credentials and connections, might as well use them to your advantage; they will open doors for you and get you pass initial screens. However, if you do not, consider my online personal brand model. It should motivate you to come up with your own ideas and get them out there, regardless of your past record and accomplishments. And it is refreshing if you would rather talk about your ideas and values, than yourself. You can learn more about this concept by buying the book: Online Personal Brand: Skill Set, Aura, and Identity.